Not too long ago, Samsung faced a big loss against Apple in court, and now, it's just sat through the announcement of the new iPhone, which sold out its preorders in a matter of hours. What's a rival manufacturer to do? That's easy; if you're Samsung, you attack. 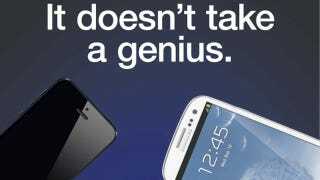 Samsung has crafted a pretty aggressive ad comparing Apple's flagship iPhone 5 to its own Galaxy S III. You can guess who comes out on top. While the lion's share of the ad's criticisms are fair—the S III does have NFC while the iPhone 5 doesn't, and the same goes for removable battery and microSD storage—the bit referring to Apple's new connector comes off as a bit snide. But you didn't expect this to be civil, did you?